PHILADELPHIA, PA – May 17, 2017– Janney Montgomery Scott LLC (“Janney”), a leading full-service wealth management, financial services, and investment banking firm headquartered in Philadelphia, PA, today announced that June D. Strunk, Executive Vice President/Wealth Management, and Shane F. O’Brien, First Vice President/Wealth Management, have joined Janney’s Mystic, CT branch office. Strunk and O’Brien are joined at Janney by Lisa M. Cayer, Senior Registered Private Client Assistant. Strunk, O’Brien, and Cayer, collectively known as the Mystic Harbor Group of Janney Montgomery Scott, were previously affiliated with Morgan Stanley and are entrusted with over $350 million in client assets. In addition to her role as Financial Advisor, Strunk will also be assuming the role as Satellite Branch Manager of the Mystic Branch Office. Strunk, a Certified Financial PlannerTM, has been advising clients in the Mystic area since 1999 and earned her Ph.D. in chemistry from Brown University. She serves as a member of the Town of Stonington Board of Finance and the K-12 Building Committee and previously served as the Board President for the Pawcatuck Neighborhood Center and the Southeastern Connecticut Women’s Network. She has also been a board member for the Estate and Tax Planning Council of Eastern Connecticut and a member of The Community Foundation of Eastern Connecticut Women and Girls Fund Grants Committee. O’Brien has over 20 years of industry experience and earned his B.S. in business management and administration from Mount St. Mary’s College. He is involved with the Lyme Youth Service Bureau, an organization dedicated to providing critical social services for children and families, 100 Club of Connecticut helping the family of fallen police officers, High Hopes, a therapeutic riding organization, and the Crosby Foundation, a group dedicated to helping people of all ages lift themselves out of poverty through education in Haiti. 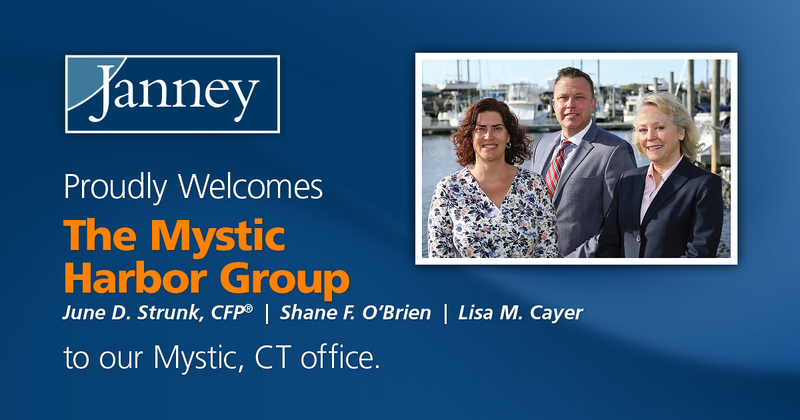 Janney opened its Mystic, CT branch office in October with the arrival of Seaport Wealth Management, a former Merrill Lynch team managing nearly $800 million in client assets. The branch office is located at 60 Willow Street, Mystic, CT 06355.